There is something about “New Stuff”, that makes old stuff look great. So today I’m posting a card that uses both, old and new. I found two New Dies from Mr. Tim or “Alterations”. Tattered Flower Garland SKU #657824. I’m using some old K & Company scraps from years ago, cut out the branch and stamped a small Hero Arts stamp on it, the using distress inks filled in my bird with color. Inked the edges. Then cut out three sets of flowers and (left the in the cut cardstock) and rubbed my distress ink over them, then removed the flowers. added the verse in jet black ink. 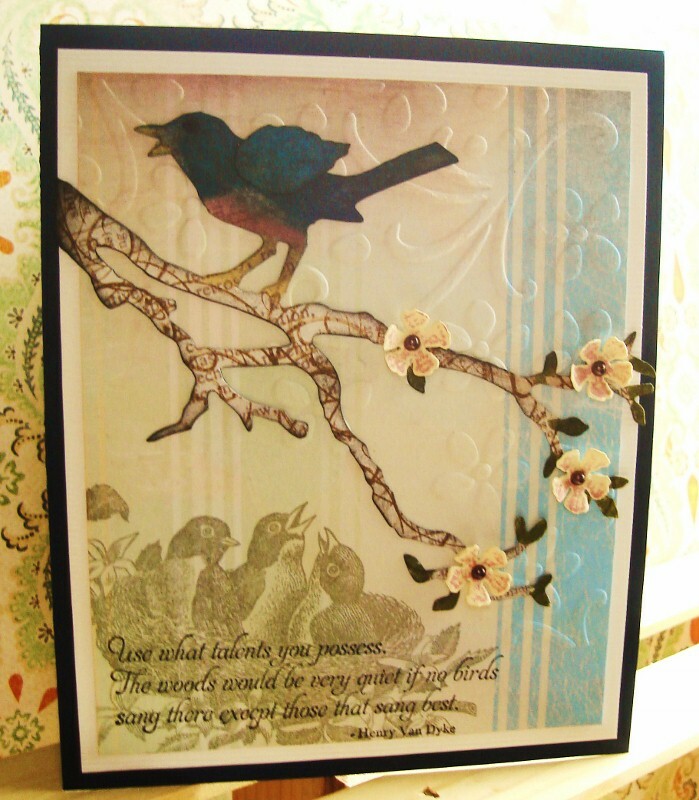 Embossed the top corner with an old Sizzix folder. Have a great day, hope your weather is far better than ours. This is really beautiful, Vada! This is a real eye catcher, Vada! Love, love, love what you did with the new die. That bird on the branch is just amazing and this would make Tim proud! Love this! Oh and it is on my list, but I did not realize that it had released! So cheerful and perfect for Spring. 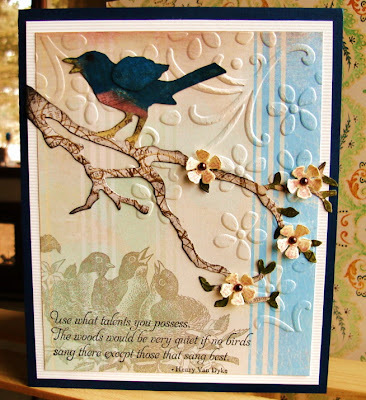 Beautiful- love the dies and the stamp of the bird- fabulous!!! Your old and new mixtures beautifully! I like it a lot! 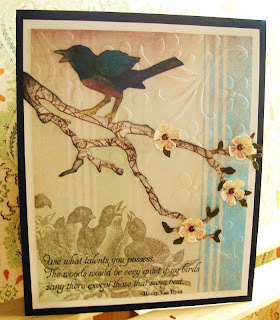 I love your mix of papers and textures! Between the embossing and the raised up flowers this is a real stunner. So beautiful! I love the subtle embossing in the back. Delightful! Wow - what a great card - I love everything about it!